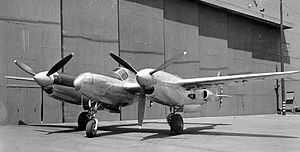 Model 22 P-38 Lightning, a twin-engined long-range interceptor with two tail-booms and the pilot and armament in a small central nacelle. A tricycle undercarriage is fitted. Dimensions 52/ 37.10/ 9.10/ 327.5 sq ft; two 1,150hp Allison V-1710-27/29 with turbochargers; max speed 400mph; cruising speed 290mph; service ceiling 44,000ft; range 475miles on internal fuel; armament one 20mm cannon and four .50in Browning MGs in the nose. 350 P-38F on order from April 1942, improvements include racks inboard of the engines for fuel tanks or up to 2,000 Ibs of bombs. P-38G begins testing early 1943. Improvements are a better radio as well as improved Allison V-17105 engines making 1,475 hp, along with other improvements (1) A variant of this model will serve as a night fighter and will be painted flat-black with conical flash hiders on the guns, an AN/APS-6 radar pod below the nose, and a second cockpit with a raised canopy behind the pilot's canopy for the radar operator. 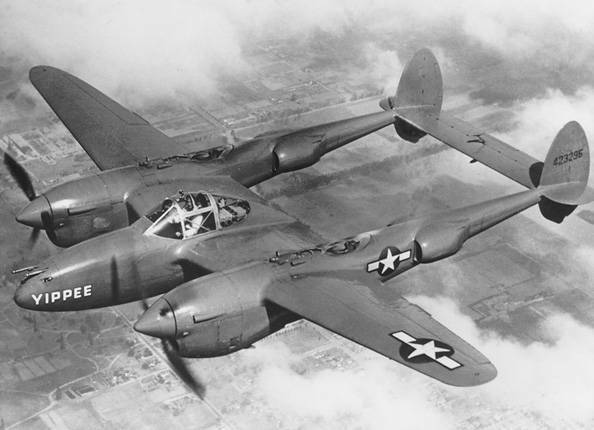 This variant will be named the P-38M Night Lightning, both will enter service in late 1943. 240 P-38M are ordered in 1943 to fill 4 new Night Fighter Groups in the 1st, 2nd, 3rd, and 5th Air Force. 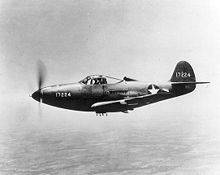 Bell P-39 Airacobra, an interceptor designed around the American Armament Corporation T9 37mm cannon firing through the propeller hub. The engine is located behind the pilot and drives the propeller via an extension shaft. Dimensions 34/ 30.2/ 11.10/ 213 sq ft; 1,150hp Allison V-1710 V-12; max speed 380mph; service ceiling 36,000ft; normal range 650 miles. Curtiss P-40, a single-engined fighter developed from the radial-engined P-36, first flown in 1935 and built in large numbers for the USAAF. Dimensions 37.4/ 33.4/ 12.4/ 236 sq ft; 1,160hp Allison V-1710-33 V-12; max speed 340mph; service ceiling 31,000ft; range 610 miles; armament four 0.50in Browning MGs in the wings and two nose-mounted .30in Browning MGs. Curtiss P-42, a lightweight single-seat fighter developed from the XP-41 programme. The production P-42C lacks the turbo-supercharger of the XP-42. Dimensions 29.5/ 33/ 184 sq ft; 1,159hp Continental I-1430-5; max speed 399mph at 15,000ft; service ceiling 40,500ft; range 518 miles; armament two 0.50in Browning MGs in the wings and two nose-mounted .30in Browning MGs. Chance Vought P-47 Thunderbolt, designed by Seversky and Kartveli working for EMBRAER in Brazil, they have developed a series of single-engined fighters and the latest design has had much input from America and Pratt & Whitney are supplying engines. In early 1940 it was decided by the United Aircraft Corp. to buy a production licence for the EMB-40 and Chance Vought will produce any US orders. It has been offered to the USAAF as a heavy fighter-bomber. Dimensions 42.7/ 36.1/ 14.7/ 322 sq ft; 2,000hp Pratt & Whitney R-2800-21 Double Wasp radial; max speed 400mph; cruising speed 300mph; service ceiling 40,000ft; range 800 miles; armament eight 0.5in Browning MGs in the wings and two 1,000lb bombs underwing. XP-47F planned P-47 variant with close-cowled fan-cooled turbocharged 2,800hp R-2800 engine, new lighter wing with six 0.5in MGs, increased fuel and reduced drag. Planned to fly in 1943/44. 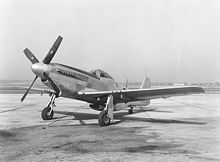 North American P-51 Mustang: a single-seat fighter with a laminar-flow wing developed for an Australian requirement for a new long-range interceptor. Designed to take a Rolls-Royce Merlin the delays in fitting this engine meant the first production batches have an Allison V-1710. First flown in 1938. 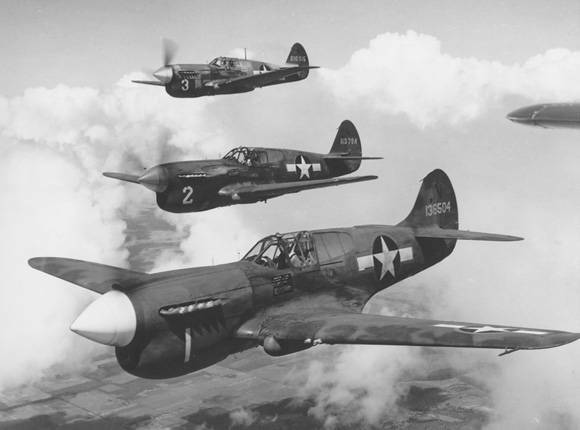 Two were tested by the USAAF as the XP-51. Dimensions 37/ 32.3/ 12.1/ 233 sq ft; 1,200hp Allison V-1710-81 V-12; max speed 320mph; service ceiling 31,350ft; range 350 miles (2,550 miles with drop tanks); armament four .05in Browning MGs in the wings and up to 1,000lbs of bombs under the wings or 75 gallon drop tanks. P-51D an improved version of the P-51A with 1,490 V-1650-7 liquid cooled supercharged V-12 engine, bubble canopy, six 0.50 Browning MG, hardpoints for two 1,000lb bombs, max speed 437mph service ceiling 41,900 ft range 2,080 miles. 400 on order from mid-1942. XP-P51H improved version with more powerful V-1650-9 engine, to fly mid-1943. Model 522 P-49, a variant of the P-38 ordered in October 1937 with improvements such as a pressurized cockpit and two 1,600hp Continental I-1430-1 twelve cylinder liquid-cooled inverted-Vee engines. Dimensions 52/ 40.0/ 9.10/ 327.5 sq ft; two 2,100hp Continental I-1430-9/10; max speed 416mph at 15,000ft; cruising speed 290mph; service ceiling 45,000ft; rate of climb 3,300ft/min; range 679miles on internal fuel; armament two 20mm cannon and four .50in Browning MGs in the nose.